Subscribe to get FREE access to woodworking plans and cross stitch patterns SIGN UP! This post may contain affiliate links. This won’t change your price, but may share some commission. Read my full disclosure here. Ok, I don’t like it, but I’ll do it if there’s a prize in it at the end (like a dramatic before and after… and maybe a cookie). Sometimes, getting dirty is just what happens when you least expect it. Take, for example, our downstairs flooring prep. After we ripped out the old carpet and swept up the dust and grime, I spotted an old (but unopened) tube of caulk in the garage specifically made for concrete. I suspect that it may have been in the box of paint supplies my dad brought over when we first moved in, but until now I hadn’t noticed. 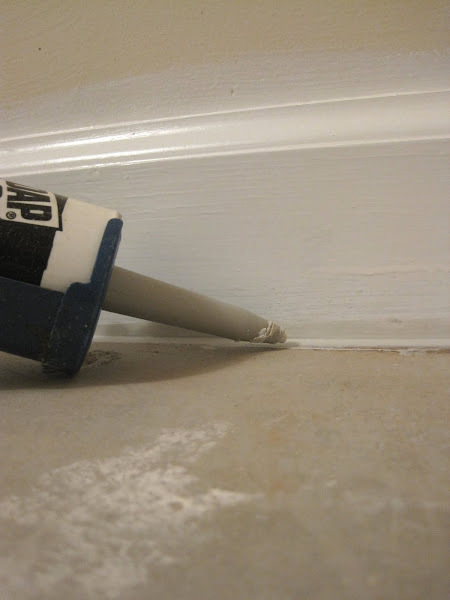 At any rate, I thought that it may be a good idea to run a bead of caulk along our baseboards where the sub-floor meets the trim, so that we can better protect the new laminate from having any moisture issues. This could be a completely unfounded theory, but I figure we’re better off trying. The first evening of applying the caulk went pretty smoothly (bah dum bum). The second night, however, was considerably more difficult. Try as I might, I simply couldn’t seem to squeeze the trigger of the caulk gun hard enough to make anything more than a tiny amount come out at a time. I’d noticed on the first night that this particular type of caulk was a bit thicker than the kind I’d used for our windows, but this was getting ridiculous. It shouldn’t be this difficult. I’d only gotten about a few feet of our living room finished when I finally noticed the problem. As it turns out, the time this tube spent in the hot garage may have caused a small crack in the side (*Georgia temps have been around a 105-degree heat index for the last few weeks). Or perhaps at some point the tube was dropped and caused the plastic to break, so putting it into the caulk gun and pulling on the trigger made an even wider hole. The pressure from the caulk gun was making the caulk spill out the side instead of from the tip. I probably would have noticed the mess sooner, but the crack was faced toward the inside of the gun. So, what should one do when faced with a messy obstacle? Well, in my case, when it comes to free caulk, I went with the flow. I was already using my fingers to smooth out the caulk line, so why not just make a bigger mess and use the ooze to finish up? I may have ruined yet another manicure, but I’m getting tired of the grayish-purple polish anyway. And now we’re one step closer to getting new floors. 1. Caulk needs a caulk gun. 2. I’ll take free caulk any day, even when the tube is broken and I don’t know what to use it for (yet). 3. Cracks ruin the pressurized function of a caulk gun. 4. Caulk is the enemy of well-manicured fingernails (and also poorly manicured fingernails – like mine). While every effort has been made to ensure the accuracy & effectiveness of the information displayed on this website, The Ugly Duckling House is for entertainment purposes only. All tutorials and demonstrations are not intended to be professional advice (nor substitute as such), and I make no guarantees as to the procedures and information here. Creating with my suggested methods, materials, and tools is under your own risk. Please ensure you are following proper guidelines with anything used, and seek professional advice if you don't know how to do something! Read my complete disclosure here. Hey there! I'm Sarah. My favorite things: 1) tearing my house apart and 2) putting it back together again. I occasionally talk about other things, like life and food and travel, but it's mostly my obsession with DIY and power tools that you'll find here! Got a DIY question? Tag me on Instagram @uglyducklingDIY or use the hashtag #uglyducklinghouse to show off your projects! Subscribing is one of the best ways to get updates, snag DIY tips, and see progress! You also get FREE access to my plans & patterns libraries! I LOVE getting messy when I decorate. In fact, its a near impossibility for me NOT to get paint/caulk/sheetrock dust etc all over me when I'm in DIY mode. I like to think of it as a sign of all the hardwork that's been done. Wear that caulk and be proud!! So funny! That is exactly what I would have done – and had caulk all over me, the floors, and everything else! Yes- and forget the manicure while you're renovating – you need those nails to scrape paint off door hinges and such! Comment Policy: I love comments, especially if they make me laugh. 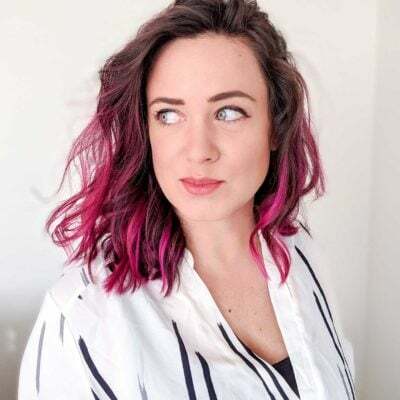 Feel free to let your words of wisdom and humor fly (there's no swear jar on this blog), but if you're overly spammy, rude, or just plain boring, you're just going to have to accept that your comment may not see the light of day. P.S. If you leave an affiliate or monetized link when making a comment on this site, such links might get overwritten by a plugin I have installed that uses my own internal tracking. See terms and disclosure page for more info! Thanks in advance. You rock. Hey there! I like tearing my house apart and putting it back together again. And MAKING THINGS. Join me for do-it-yourself home improvement tips, tutorials (even crafts and food! ), and renovation realities from a short gal in the power tool aisle. Subscribing is one of the best ways to get updates, snag DIY tips, and see progress! While every effort has been made to ensure the accuracy & effectiveness of the information displayed on this website, the Ugly Duckling House is for entertainment purposes only. All tutorials and demonstrations are not intended to be professional advice (nor substitute as such), and I make no guarantees as to the procedures and information here. Creating with my suggested methods, materials, and tools is under your own risk. Please ensure you are following proper guidelines with anything used, and seek professional advice if you don’t know how to do something! Read my complete disclosure here. Unless otherwise stated, all images owned by Sarah Fogle & the Ugly Duckling House. Re-posting content is not allowed, no exceptions. For more on photo licenses and other use permissions, click here (in true UDH style, it’s actually kind of fun and snarky to read).